The appointing of Wiranto, a former New Order general accused of severe human rights abuses as Coordinating Minister for Political, Legal and Social Affairs has courted controversy with West Papuan activists. The appointment by President Widodo has been seen negatively at a critical time when West Papua is dominated by the unresolved human rights issues which President Widodo had promised to address. In recent years, two key issues have come to dominate the political dynamic in Papua: domestic security across the region, and unresolved human rights issues. Wiranto’s predecessor, former general Luhut Panjaitan, has worked to address these issues over the past two years. But the appointment of Wiranto, who served as a military general during the early days of the reformasi period, will determine whether West Papua can move towards a long-overdue breakthrough. A key concern is if the former general will take the same stance as his predecessor. While the current administration prefers to promote a developmental agenda in Papua, the region remains highly securitised. Since its integration into Indonesia in 1969, the province has witnessed persistent instability. The military presence is highly concentrated and there are plans for further military build-up in the future. Among these, a brigade police (BRIMOB) headquarters is planned for Wamena; a new military territorial command (Kodam) is slated for Manokwari; while in Biak, a new Air Force base is to be built. In Sorong, a new Eastern Central Fleet will add between 7000 and 10,000 personnel. At the same time, protests about the political and historical status of Papua have become more common in the past two years. Largely coordinated and mobilised by students and activists, they have drawn attention and support from the local population. In response, local security apparatuses have arrested, and in some instances are alleged to have tortured, protestors to contain the spread of demonstrations. Still, protests are likely to increase in the near future, thanks to the international campaign of West Papuans led by the United Liberation Movement of West Papua (ULWP) in the South Pacific. Against this backdrop, the new coordinating minister Wiranto is likely to back plans to expand the military’s presence in the region. Protests against the military build-up will stir up memories of human rights violations in the past, but the new minister has no strong reason to roll back the plans. Instead, Wiranto will likely tighten restrictions on popular protests in Papua. Wiranto’s background as a former military commander who dealt with regional disputes in the early days of reformasi will likely mean that he will continue the current securitisation of Papua. Another prominent agenda during Luhut’s short period as a minister was to address human rights violations in Papua. He formed a special task group comprising government officials, human rights activists and Papuan community leaders to discuss and find solutions to historical and more recent instances of human rights abuses in the region. Three cases have since been categorised as human rights violations: the Wasior incident in 2001; the Wamena incident in 2003; and the Pania shooting in 2014. But the inclusion of only these three cases has drawn criticism from Papuans, who argue that many historical human rights violations have been overlooked by the government. Among these are the massacres that occurred in the 1970s, including a military operation in 1977–1978 that cost many indigenous lives, and a dozen shootings in various cities in Papua. The three cases chosen by the task group also point to an important shortcoming: the lack of victim perspectives, particularly from those Papuans unfairly treated by security forces. There is insufficient room for the families of victims of human rights abuses to counter the rhetoric of security apparatuses which, on many occasions, have been overly willing to label Papuans as separatists for publicly expressing their political and cultural views. The Indonesia government has also seemed reluctant to engage in productive and comprehensive dialogue with Papuans over their grievances. Concerns about Wiranto’s record on human rights, particularly in East Timor in 1999, will further hamper his ministerial performance and hinder programs to address gross human rights violations in Papua. The former military commander is thought to be implicated in the Biak Massacre in July 1998 that claimed over 100 Papuan lives, as the massacre occurred when he was Commander of the Indonesian Armed Forces. 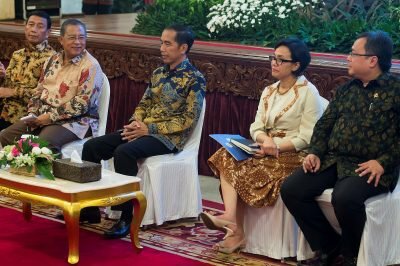 His reputation may hamper progress towards long-overdue reforms needed to deal with the human rights issue in Indonesia’s easternmost region. The appointment of Wiranto indicates the Jokowi administration’s continued reluctance to comprehensively address sensitive problems in Papua. This will likely be perceived as another half-hearted gesture by most Papuans and will exaggerate the problem of mistrust between Papuans and Jakarta.